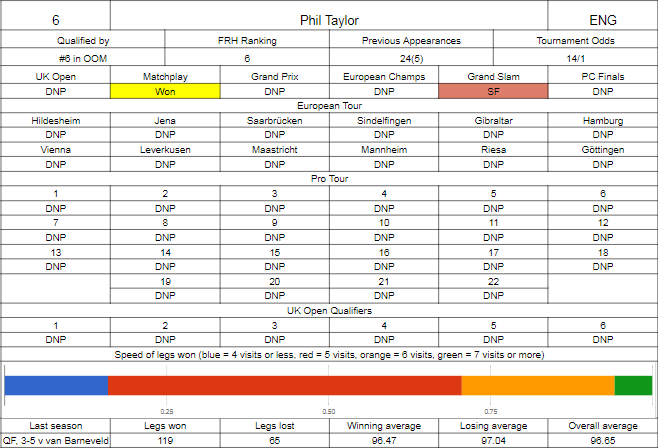 And so we reach the end of the Phil Taylor Retirement Tour, well I say tour - at least in terms of ranking events, he's barely played. We knew he wasn't going to play any of the floor events, which de facto bars him from the UK Open, European Championship and the Players Championship Finals, but withdrawing from the Grand Prix was one that most observers didn't see coming, which leaves him with two events on the books - the first being the Matchplay, which even the biggest of Taylor haters, myself included, must have been pleased to see happen. He did it in quite some style as well, only Gerwyn Price really pushing him close in the opening round to hold on at the second break before Taylor pulled away, but Barney couldn't win more than three legs, van Gerwen imploded, Lewis was doing OK but couldn't keep up, and Wright fell behind and couldn't begin to make any sort of comeback. A remarkable win over a tough field that a lot of people didn't think he still had in him. The other ranking event he played was the Grand Slam, where he reached the semi final, although if Robbie Green didn't choke away a group stage game, Taylor may not have even got out of the group (but probably turns it on against Wade, a second straight awful final group stage match from the Power). A comfortable win over Darren Webster was followed by a one-sided pummelling over Daryl Gurney, where again Taylor couldn't get it quietly as he couldn't against van Gerwen in the Matchplay, and it'd be the Dutchman who eliminated him in the semi final. On the exbo circuit, he finished third in the Premier League but lost a deciding leg to Peter Wright in the semi finals, won a very tough Champions League group but then got turned over by Gary Anderson in the semi finals, the same result that was seen in the Masters. He can still do it, and the format where he's got plenty of time to rest should help. It's not a bad draw either, the first tough draw realistically is Anderson, but if seedings go to plan he'll have to go through the world number 3, 2 and 1 in order to claim the title. 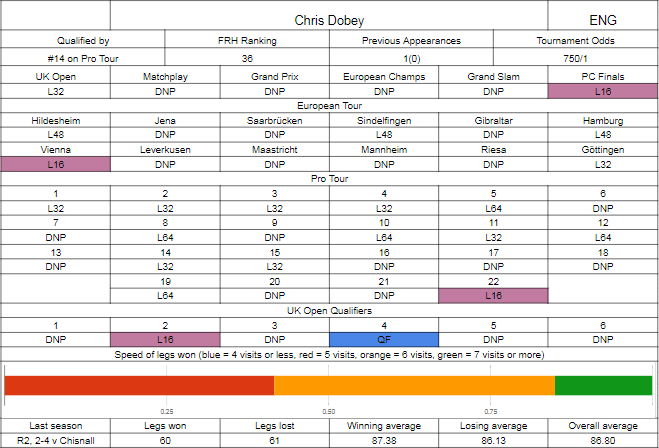 This time last year, Chris Dobey was the much talked about next big thing - an impressive run in the Grand Slam, he'd made his first Tour final, and had a solid win over Justin Pipe at the worlds and kept things tight with Dave Chisnall for four sets in the second round. It looked like he would keep things going in 2017 early on - two good qualifying runs got him straight to the money in the UK Open, but there after beating Kevin Painter he'd have an odd loss to surprise package Martin Lukeman. Things went downhill from there - the four board finals he started the Pro Tour circuit with would be the best he'd do all year until the final event, and while he did make three of the first six European events, he'd lose in the first round each time, to Jamie Bain and Peter Jacques in deciders, and Steve West fairly comfortably. This bad form, possibly as a result of becoming a dad around the time, saw him narrowly miss out on qualifying for the Matchplay, and while in Vienna he'd pick up wins over Dave Pallett and Stephen Bunting for the loss of one leg to regain some form, he couldn't get enough money in the bank to make Dublin, or qualify for any more events in Europe to make Hasselt. He wasn't even certain to make it here, needing to claim a first round win in Göttingen and a board win in the last Pro Tour event to be safe. That run made him safe for Minehead where he did at least get some sort of form going, beating Kim Huybrechts and Robert Thornton before going out to Daryl Gurney. Can't look past Taylor. The Dobey of last year might have made this more interesting, but look at that stat bar - sixty legs won, and not one of them was in twelve darts. That hints to a huge absence of scoring power, which is what he's going to need to challenge the Taylor throw. I think it'll just be a case of Chris enjoying the experience, throwing the best he can and then looking towards next year, unfortunately. It's quietly been a solid year for the Force, who's hanging around in the top 32 where after last year's first round exit, it looked like he might have dropped out of that elite group and need to rebuild back upwards. He was unconvincing in UK Open qualification, needing a win over Ryan Meikle to make the money, that he did 6-0 but would then draw eventual finalist Gerwyn Price in the last 64 and lose 10-5. His early Pro Tour form was a bit hit and miss, but he did reach a few board finals, put together a very solid streak of European qualification (although only winning one match in seven attempts once on the European stage must be bitterly disappointing, being whitewashed by Dan Larsson, losing a decider to Clayton, managing to beat Ratajski before losing to Cullen, back to back weekend defeats to Eidams and Wade, then in September going out to Kyle Anderson and Kist), before having his best result of the season in the run up to the Matchplay with a semi final result, beating the German pair of Schindler and Hopp before running through Cullen and Searle for the loss of three legs, nicking a decider against Henderson before losing to Daryl Gurney. At the Matchplay itself, he'd get a winnable game against Jelle Klaasen, and he took the chance, but Suljovic would be too good in round two. He might have done better in Dublin, losing a deciding set to Alan Norris in a section of the draw that opened up when van Gerwen lost, did qualify for the World Series finals and get a good win over Dave Chisnall, but it's the last event that was the highlight with a first major semi final in quite some time at the Players Championship Finals. An opening round win over Mark Webster was routine, but then needed three deciding legs to defeat Ron Meulenkamp, Willie O'Connor and Daryl Gurney, before running into Michael van Gerwen. That must give him a lot of confidence coming into Ally Pally. Next we have a couple of international qualifiers that I really don't know much about. Taking the big favourite first - Smith is a New Zealander who's been around for quite some time on the domestic circuit with a dartsdatabase record that dates back to 2003, who qualified by winning the Oceanic Masters, not beating anyone outside of David Platt in the quarter finals that I know, but the event in the past has seen the likes of Platt, both Anderson brothers and Simon Whitlock emerge victorious. He initially tried to qualify for here through the New Zealand qualifier, losing in the semi final to Warren Parry, who was then solidly defeated by Cody Harris in the final - Harris played a couple of the World Series events, getting three legs off Taylor and four off Whitlock, so I've got to guess that Smith's level is a bit off that, although in 2016 he did play the Auckland Masters and get two legs from Gary Anderson, although he only averaged 83 when Anderson was doing everything he could to help inflate it by averaging 106 himself. 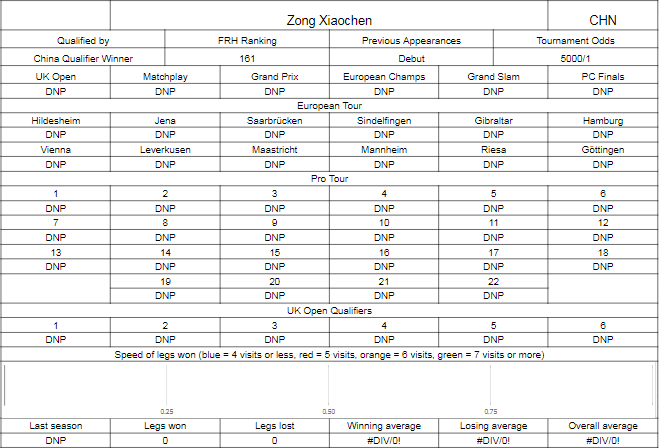 Zong played the Chinese qualifier last year and lost in the semi final to the player that lost to Sun Qiang, he who averaged under 70 in a loss to Corey Cadby at this stage last year. This year Zong won the event, winning the last two matches in deciding sets. The Chinese standard hasn't been great historically, so we need to look to see if Zong may be any different to what's been served in the past. He's still very young, the qualifier writeup indicating he's still a teenager, he did play the world youth last season and reach the second round, and he also played in the Shanghai Masters, where he didn't take a leg off a James Wade averaging barely 80, while Zong averaged just 66. If you want a big red flag then that's it. Really can't see how Smith doesn't win the prelim and then lose the first round match. Both will probably be a bit nervous, but Smith seems clearly the better player on the stats and has enough experience, at least on smaller stages, to come through any issues that arise from that. 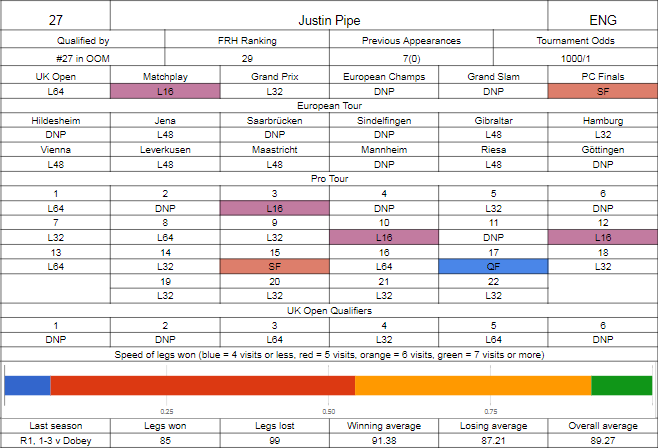 Pipe's upturn in form in the last few months should see him play at a level whereby he advances comfortably. He does have some potential unmeasurable factors working against him - it's been four years since he won a match on this stage, and qualifiers from the southern hemisphere have course and distance over him, with Loz Ryder having knocked Pipe out at this stage in 2015.